Find Cape Shores real estate listings below! Located on the picturesque coastline at the mouth of Delaware Bay in Lewes, residents of Cape Shores are surrounded by captivating views at every turn. The entire beachfront community is encompassed by either State Park land or the Ocean, making it one of the quietest and most tranquil subdivisions in the area. 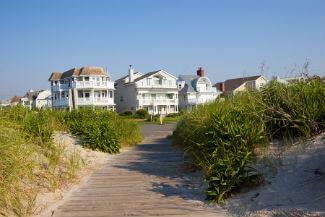 This magnificent community is peppered with large and unique coastal homes. While the homes themselves are quite stunning by themselves, they're made even more magical by the panoramic views of the bay and great lifestyle amenities just steps from the homes. With so much natural beauty all around, it's easy to see why Cape shores homes for sale are never for sale for long. Browse all of the current listings to find your perfect piece of waterfront paradise, or keep reading to learn more about the types of homes for sale in Cape Shores and the areas many desirable amenities. Every home in Cape Shores is nothing short of stunning. Although these homes are great pairing for anyone, they're especially sought-after by retirees and families in pursuit of a move-up home near the water. Most of the homes in Cape Shores are quite large, with a two-story floorplan at the bare minimum, although its more commonly three. Because every home has been custom built, there's a terrific mix of properties, from small to large and simple to luxury. Nearly half of all of the homes in the community are situated right along the coastline just a few steps from the beach. That said, those that aren't located adjacent to the shoreline are certainly not far from it. There are at least four entrance points that make it easy for everyone to access. and a long private pier, perfect for fishing and sightseeing. Cape Henlopen State Park is quite literally right next door, so it couldn't be easier to hope on a bike or go for a stroll into the park. Home owners are also just 2 miles from the heart of Lewes and its artisanal eateries, eclectic shops, quaint art galleries, and coast-inspired clothing stores. If you're looking for a home in Cape Shores, get it touch with the Lewes real estate professionals at Mann & Sons Inc. today! Send them a message or give them a call at 302.227.9477 today!